He said the politicians would try to win their favour over kava as we soon enter into an election season. He was speaking at the opening of Naseyani Primary School’s new $224,000 Dining Hall. “My advice to you is to pay attention to those who can give you inclusive development. My advice to you is to pay attention to those who genuinely care for you. My advice to you is to pay attention to those who can focus on a positive future for you and our country,” he said. He said more than a year ago yesterday, he sat in this very village, speaking face-to-face with many of the same faces which he had the pleasure of seeing there yesterday. When he went there to commission the new Naseyani School, he went with the spirit of talanoa, of open and constructive dialogue, on how we could expand on that success to build even further upon the progress that we had already made. He said each community in Fiji was unique, and each faced a unique set of challenges. He said this dining hall wasn’t just about the accomplishment, it was about much more than just a new facility, more than the new furniture and gas burners, and even more than the students who would use it. He said it was about those students’ future. 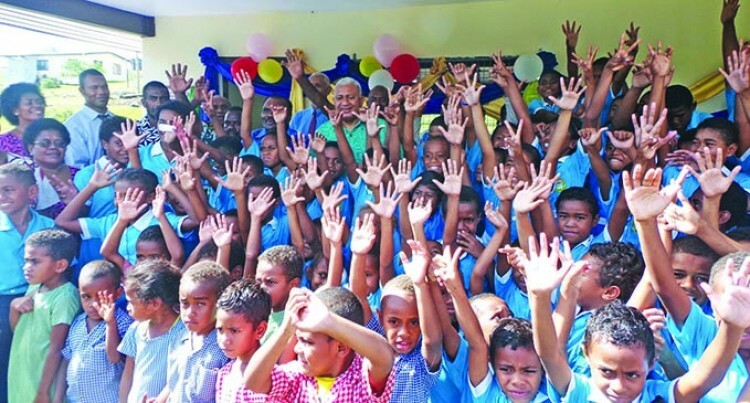 “This is why I am so passionate about making long-term investments in Fiji’s future generations, whether it’s fighting to combat climate change on the global stage or providing free primary education to all Fijian students for the first time in our history,” he said. “It is why, through new scholarships and our TELS programme, that my Government is opening doors to tertiary education to new generations who would once find it out of reach. “It is this vision, this forward-focus, that drives us to invest so heavily in infrastructure, and it is why we are dedicated to nurturing innovative and exciting industries. “Because whether we are preparing for a changing economy or a changing climate, the new Fiji is built not only to last, but to flourish. Together, united like never before, we are building the Fiji of tomorrow, today. “To those outside of this community, this dining hall might seem small. But this was part of a much bigger story that we are taking part in—because when we say that we’re building back bigger and better than ever, we aren’t just talking about our schools or our dining halls.